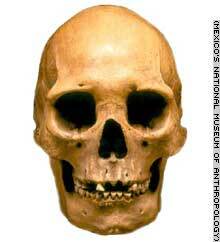 The "Pe�on Woman III" skull was found near Mexico City International Airport. (CNN) -- Researchers said it may be the oldest skull ever found in the Americas: an elongated-faced woman who died about 13,000 years ago. But perhaps more significant than the age, researchers said, is that the skull and other bones were found while a well was being dug near Mexico City International Airport. Because the remains were discovered outside the United States, scientists will be able to study the DNA and structure of the skeleton without the objection of Native American groups, who can claim and rebury ancestral remains under a 1990 U.S. law. "Here Mexico is providing the opportunity to see what clues these bones can yield about man's arrival in the American continent," Mexican anthropologist Jose Concepcion Jimenez Lopez said. The oldest skull in the Americas up to now, believed to be that of "Buhl Woman," was found in 1989 at a gravel quarry in Idaho. Scientists said it dates back 10,500 to 11,000 years. But researchers scarcely studied those bones before the Shoshone-Bannock tribe claimed and reburied them. The "Pe�on Woman III" -- which scientists believe is now the oldest skull from the New World -- has been sitting in Mexico City's National Museum of Anthropology since 1959. At the insistence of geologist Silvia Gonzalez, who had a hunch that the bones were older than previously thought, the remains were taken to Oxford University to be carbon-dated. And indeed, tests proved Gonzalez's assertion. Scientists said they believe that the Pe�on Woman died anywhere from 12,700 to 13,000 years ago at the age of 27. Did humans arrive in the Americas by boat? 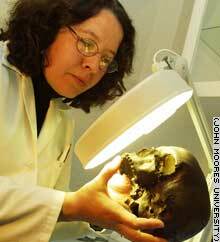 Geologist Silvia Gonzalez studies an ancient cranium. Emboldened by her finding, Gonzalez will try to prove her theory that the bones of the Pe�on Woman belong not to Native Americans, but to descendants of the Ainu people of Japan. She said she bases her hypothesis on the elongated, narrow shape of the Pe�on Woman's skull. Native Americans, she said, are round-faced with broad cheeks. "Quite different from Pe�on Woman," she said. She said she believes descendants of the Ainu people made their way to the New World by island hopping on boats. "If this proves right, it's going to be quite contentious," said Gonzalez, who teaches at John Moores University in England and received a grant last week from the British government to conduct her research. "We're going to say to Native Americans, 'Maybe there were some people in the Americas before you, who are not related to you.' "
Gonzalez's theory is controversial but gaining credence in scientific circles, where up to now many believed hardy mammoth hunters were first to arrive in the Americas 14,000 to 16,000 years ago by crossing into Alaska from Siberia. Gonzalez and other scientists said they believe people may have arrived in America as much as 25,000 years ago. She points to evidence of camps -- man-made tools, a human footprint and huts dating back 25,000 years -- that have been found in Chile as evidence of man's imprint on the Americas long before mammoth hunters. Gonzalez will embark on a three-year journey to prove her theory. As part of that journey, she will travel to Baja California to study the Pericue people, who shared the same elongated faces of the Pe�on Woman. She said she believes that the Pericue, who for unknown reasons went extinct in the 18th century, may hold the answers to coastal migration of man from Asia to America. The bones of the Pe�on Woman will have DNA extracted to compare it with genetic matter of the Pericue, she said. Scientists also said they hope to study clothes fibers found near the skeleton and try to piece together how the woman died. Gonzalez said the skeleton does not show any wounds or obvious injuries. "We still have a long way to go," she said. "But we have a good start."